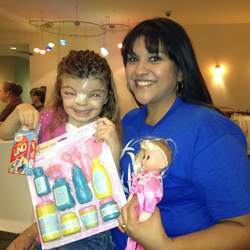 To Give A Smile has a wide variety of volunteer opportunities. Whether you’re comforting a child who is ill or your helping to organize a fundraiser you become the face of To Give A Smile. Our volunteers play a major role in the day-to-day operation of the organization and their dedication to our mission is priceless. Please read below if you would like to learn more about domestic and international volunteer opportunities. The organization reaches children and their families through a number of different types of local outreaches. Our outreaches include activity nights, providing meals and toys, and delivering care packages. We also have a number of fundraising volunteer opportunities throughout the year that are crucial to allow us to spread hope and provide medical care to children around the world. To gain more information on volunteering, check out our upcoming events section of our website for all the latest opportunities you can plug into and make a difference. Through our global outreaches we facilitate mission trips to impoverished locations where our volunteers uplift children and their families and help provide necessary medical care. As a volunteer, you will have the opportunity to interact with people while taking part in an outreach that changes hundreds of lives over the course of the trip. You will walk away knowing you have left an everlasting impression. Are you called to serve the sick and the broken hearted on the ground in a foreign country? If you answered yes, watch the short video of our President interviewing our Director of International Missions, as he answers the commonly asked questions on how to get involved. Anyone 15 years of age or older is eligible to join us on a mission trip. Children under the age of 15 must be accompanied by a parent, family member or appointed guardian. A list of immunizations recommended or required for the trip will be provided in the initial packet along with passport/visa requirements. All immunizations are the responsibility of the individual traveler. We take the safety and security of the team as a top priority at all times. The organization partners with supporters on the ground in each location to ensure every mission trip is safe and enjoyable.